The post-holiday blahs hit the box office as none of the studios bother to offer up anything new on this weekend where the NFL playoffs and the college football championships sit solidly at center stage. Even the awards contenders are taking it easy, with Calendar Girls being the only previous limited release to see any significant expansion. That film moves from 42 to 745 screens and is aimed directly at the Baby Boomer segment. 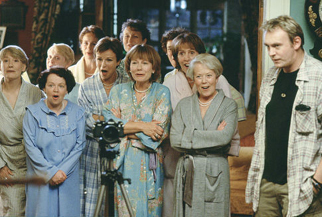 A charming story about a group of British women who pose naked for a calendar that will raise money for leukemia research, Calendar Girls has been sometimes compared to The Full Monty but is probably even more limited in scope than that eventual Academy Award nominee. Calendar Girls is also a far less likely awards contender than The Full Monty, but a couple of its actresses (Helen Mirren and Julie Walters) do have a chance at awards attention. The film averaged $9,441 on its 42 screens last week, but will see a significant per venue drop as it moves to a wider release. It will come in somewhere around the bottom of the top ten with a $3 million total. The rest of the top ten will be comprised of holdovers, most notably The Lord of the Rings: Return of the King, which hurtles ever closer to the title of biggest box office hit of the year. Throughout the holidays, the film trended ahead of both of its predecessors and sat at $250 million going into the new year. This weekend will mark the first time ROTK exhibits anything close to a "blockbuster" type of decline, with $26.3 million more added to the coffers by the end of Sunday. Steve Martin's 2003 deal with the devil continued as his follow up to Bringing Down the House, Cheaper by the Dozen, surprised many prognosticators over the holiday weekend by pulling in a remarkable $27.6 million (and $35 million if you count its Christmas Day opening). It's a film that appeals to a huge demographic, from the boomers who enjoy Martin and co-star Bonnie Hunt to the teens and young adults who are hot for any of the various young stars, including Hilary Duff, Ashton Kutcher, Piper Perabo, and Smallville's Tom Welling. Expect that success to continue as Cheaper by the Dozen should find numbers in excess of $20 million for a second weekend in a row. The rest of the top ten will be comprised of a wide-ranging combination of awards contenders, family flicks, and Ben Affleck. Current Academy Awards frontrunner Cold Mountain should continue to attract a solid audience, while Something's Gotta Give, Paycheck, and Peter Pan will all settle in with very similar box office totals over the Friday-to-Sunday portion of the weekend. Also noteworthy is the fact that this weekend is the one where we will finally see Elf and Bad Santa have some significant drop-off in audience, since the holiday themes lose some appeal as the decorations come down.